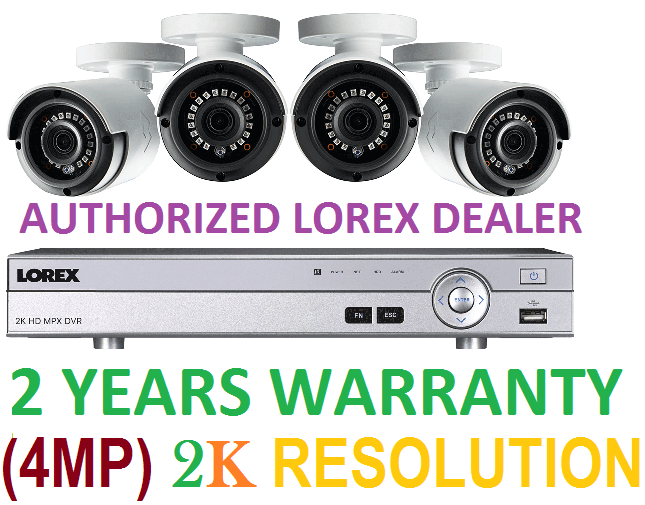 Monitor your property like never before with this outstanding 4MP Super HD security system from Lorex. 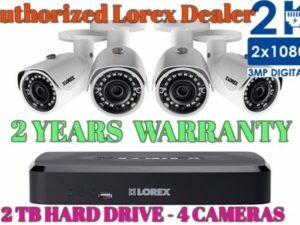 This top-of-the-line system includes our cutting-edge 4-channel 2K HD DVR with 4 bullet security cameras featuring 4MP (2K) HD resolution. The included weatherproof cameras deliver exceptional image quality day or night, with Color Night Vision in low light conditions and long-range IR night vision in complete darkness. Everything you need for setup is included, giving you professional-grade security protection for your home or business. Take your home or business security to new heights with security cameras that go beyond standard HD. Equipped with powerful Super HD 4-megapixel image sensors, the included bullet security cameras record at a 2K resolution – double that of 1080p HD. Super HD 4MP video offers clear identification and exceptional detail, ensuring that you never miss out on important evidence. 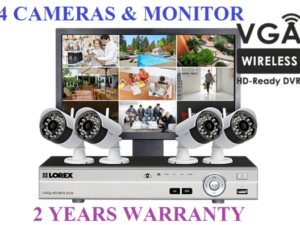 This higher resolution (2592 × 1520 pixels compared to 1920 × 1080) will make sure that your security videos are richer with detail than ever before. It will also allow you to digitally zoom in tight on faces or license plates without drastically reducing the video clarity. Standard siamese BNC cabling is used to connect MPX security cameras. This BNC cable provides both video and power transmission up to 300ft for an easy-to-install process that will have your surveillance system up and running in no time. If needed, analog HD cameras can be installed further than 300ft away, but the camera will need to be plugged in directly to an electrical outlet. The DV800 Series DVR is designed for use with our innovative hassle-free Flir Cloud™ app. Using FLIR Cloud™, you can quickly and easily view your security system remotely from your smartphone or tablet. There are no difficult port forwarding or other complicated network setups either. Simply download the free app, scan the QR code on the DVR and your cameras will appear for you to monitor (or review footage). You can also program the app to send you motion-activated push notifications and email alerts with screenshot attachments straight to your phone to keep you connected to your property at all times. The included security cameras are equipped with 2 nighttime viewing technologies. 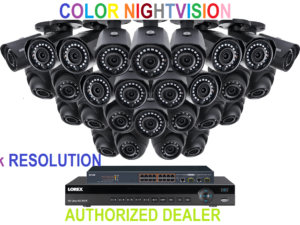 Our innovative Color Night Vision™ (CNV) creates full-color video in low-light conditions. See people and objects in color just like in the daytime with CNV. This will provide more informative nighttime video than ever before. See clearly even in total darkness with IR LEDs, which produce detailed black and white images in conditions that are too dark for CNV. IR night vision up to 130ft (40m) in ambient night time conditions and up to 90ft (27m) in total darkness ensures that you never lose sight of important details and events around your property. The included security cameras feature a weatherproof IP66 rating and can withstand outdoor temperatures of -22° ~ 140°F. The cable pass-through mounting bracket further protects the cables from being tampered with to ensure year-round security coverage that never stops. DVRs such as this are capable of working 24/7 without a break. Thankfully, so is the 1TB hard drive within it. 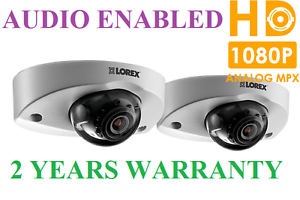 Lorex uses security certified hard drives that are manufactured specifically to meet the high workload demands of continuous security monitoring. This means that you can rely on this professional grade hard drive to safely store weeks (or even months) of security footage. It is also possible to manually upgrade the hard drive within the DVR to a hard drive up to 8TB in size. 8/16 ch: HDMI: 3840×2160; 2560×1440; 1920×1200; 1600×1200; 1680×1050; 1920×1080; 1440×900; 1280×1024; 1280×720; 1024×768, 4 ch: Supports up to 4MP through the HDMI port. For all models, VGA output is limited to 1080p (2MP). 1. Compatible with select 4MP cameras, 1080p & 720p MPX cameras and standard analog cameras. 2.Recording time may vary based on recording resolution & quality, lighting conditions and movement in the scene. 3. HDMI output up to 4K (8/16ch), 4ch supports up to 4MP output. VGA output is 1080p for all models. Up to 2K (4MP) recording resolution is limited to a maximum of 4MP per channel. Image quality and resolution is dependent on the type of camera connected to the DVR. VGA output is limited to 1080p resolution. 4. Requires a high speed internet connection and a router (not included). A minimum upload speed of 3.5Mbps is required for the best video performance. Up to 2 devices may connect to the system at the same time. 1/3 (1/4) ~ 1/50,000 Sec. 1. 4MP SuperHD cameras are compatible with select Lorex HD DVR recorders. Your item will be shipped from manufacturer warehouse within 1-4 business day(s).